The Young Maid & Old Sailor, Frances Bartolozzi, 1785, British Museum. Bartolozzi's print is an interesting exercise in contrast. 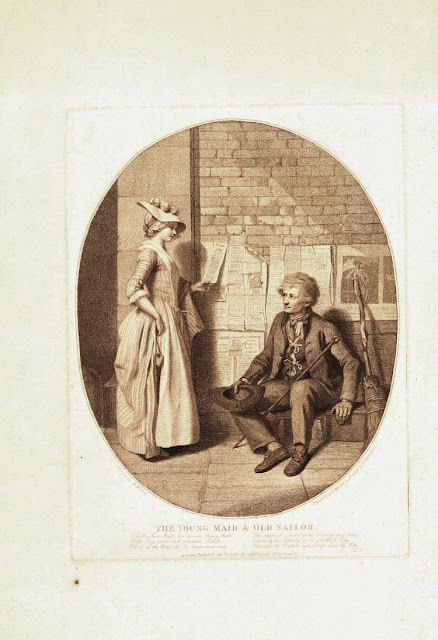 Standing on the left is a young female in the latest fashions of the middling or upper classes.Sitting on the right is an old male of the lowest class, begging to make ends meet. The contrasts of male and female, young and old, poor and wealthy are emphasized by the differing postures of the figures and the use of light and dark. The sailor is bare headed, allowing us to see his short cut white hair. At his neck is a dotted neckcloth, tied close to the neck. 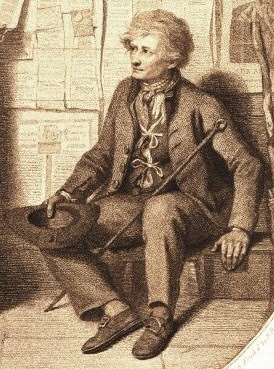 His jacket is single breasted, matching the material of his waistcoat. The waistcoat is an interesting piece, tied in front rather than buttoned. I have never seen a waistcoat bound this way before! His trousers are cut close to the leg, but longer than most. Sitting down, they come up to about the height that a modern pair of trousers or jeans might. Round toed shoes are at his feet, and a stick lays across his lap. In his hand, being held out for what money he can get, the sailor clutches his hat. The hat is buttoned on the side facing the viewer, but I can't quite make out what type of hat it is. It could be alternatively interpreted as a round hat with floppy brim, or a cocked hat held at just the right angle. EDIT: It has been called to my attention that I have misidentified the garment beneath his jacket. It is not a waistcoat at all, but an underwaistcoat. Over at the blog The Buffalo Trace, underwaistcoats are explored in some detail, including a reference to an original that just about perfectly matches the one above. It has also been called to my attention that this print is a reproduction of an earlier piece by a completely different artist: "A Girl Buying a Ballad" by Henry Walton, in the collection of the Tate Museum, originally painted in 1778. The figure on the right may have been later dubbed a sailor, because of his trousers, round hat, and cane. Overall, this entire piece is in doubt as to its validity for our study, so I may have to set it aside when doing some larger analysis of sailors' clothing and change over time.